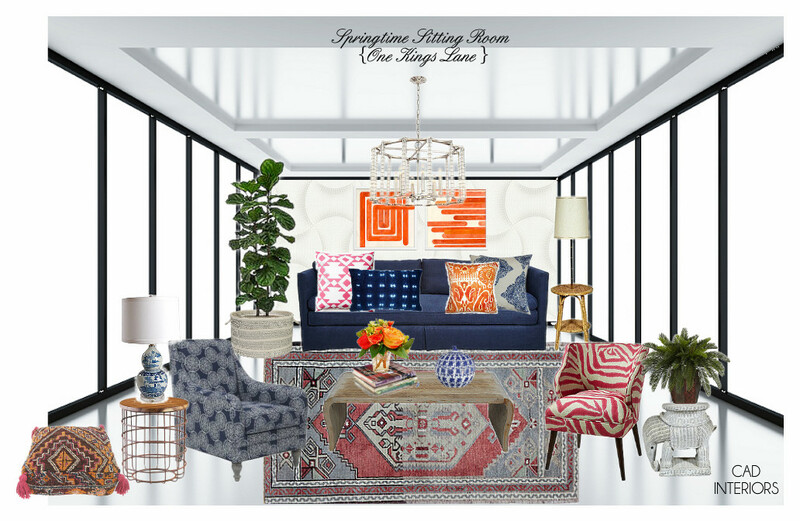 Color, texture, and pattern abound in this living room design that I created for One Kings Lane. This sponsored challenge was all about creating a spring-inspired retreat that incorporates the hues of the season. For this project, I injected shades of blue, pink, and orange to bring some spring color into the room. As with most of my designs, there is an eclectic feel to this space. If you look closely, no two things match! The repetition of colors throughout the room is what provides balance and cohesion. The design also has a quirky dose of the unexpected! Do you spot the elephant next to the "zebra"?! Or on a more subtle note, did you notice the patterned wallpaper behind the sofa? All of these elements add more texture, depth, and dimension. If you are on the hunt for furnishings, decor, or home accessories (or simply want to browse), One Kings Lane is a great online resource for unique and interesting items. They offer a wonderful selection of high-quality merchandise for your home! It is a great eclectic combo and I love the pops of orange. I followed the link and I was impressed by the wealth of sidetables. Thank you! Isn't it a great place to go browsing?! Sometimes I get lucky and find something I can actually afford. :) But if I'm on the hunt for an "investment" piece, I'd definitely browse OKL.